Baking Bread in Cast Iron - No Preheat Method - Photos! 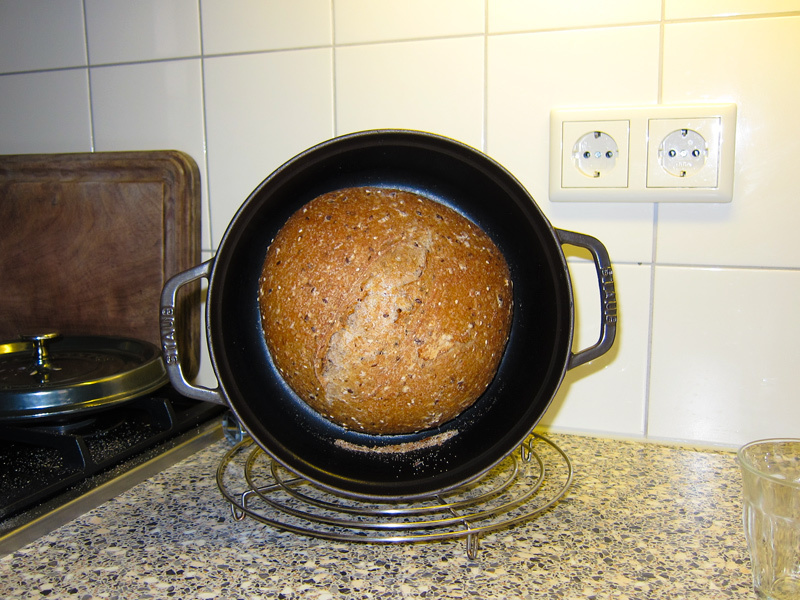 There has been a flurry of discussion in the past weeks on baking bread in a cast iron dutch oven. Many TFL members use this method. It produces great breads but many find it problematic to lower the risen dough into a preheated pot. On November 9, 2010, TFL member dmsynder asked whether it was necessary to preheat a cast iron dutch oven prior to baking in order to get a good rise and crust. (His post can be found here). The bread recipe I use is a fairly standard sourdough. Ingredients are refreshed sourdough starter (at 100% hydration), commercial unbleached white bread flour, organic whole wheat flour, water and salt. Whole wheat flour is 20% of total flour. Dough hydration is 72% (this includes the water in the levain). I baked two loaves. For each two-quart capacity dutch oven, I had 18 ounces (prebaking weight) of dough. The dutch oven was lightly greased. After shaping, the dough proofed directly in the dutch oven. During proofing, each dutch oven was slipped into a food grade plastic bag. (I help myself to these bags from the produce section of my favorite supermarket - they're just the right size). When ready to bake, the dough had risen close to the top of the dutch oven. The oven had been thoroughly preheated to 500F so it was ready when the dough was ready. The dough was slashed, lightly misted, covered and loaded into the oven. The oven temperature was lowered to 475F, so it baked at somewhere between 500F to 475F for twenty minutes. At the end of this time, the dough had risen about 1 & 1/2 inches, slashes had opened and the dough was just beginning to color. The lid was removed, temperature was lowered to 450F and the bread baked in the (uncovered) dutch oven for 20 minutes more. At the end of the bake, when removed to the cooling rack, I was delighted to hear the (greatly desired) crackling as the crust cooled. After cooling, the post-baking weight of each loaf was slightly over 16 ounces. I can't wait til I learn to make bread like that! Your breads just look beautiful...if only mine can rise so high. When baking in my pre-heated dutch oven (I have a 4.5 quart Emile Henri), I help move the shaped dough into the dutch oven by letting the dough proof directly on parchment paper. No mess, easy sling, no big clean up of my dutch oven after the baking. I can also re-use that same parchment for a few more bakings before discarding it. Although I researched a good deal and called the manufacturer directly to ensure that my empty Emile Henri can sustain the pre heat stage without fear of cracking, I do admit to feeling a bit nervous about pre heating it. KAF has also advocated the non necessity of pre-heating the d.oven. Your posting and conclusion have now convinced me that it is not required to preheat it, therefore I will start baking in it and with it "cold". Thanks for your posting. Is the bottom crust colored to the same degree as the top when you don't pre-heat the DO? ..about my bottom, do you? Naughty man! ...BUT the bottom of the dutch oven is buffered with a thin layer of coarse corn grits and a round of parchment paper is placed on top of the corn grits (since I don't want corn grits baked into the bottom of my bread). When I bake in a preheated dutch oven, the bread's bottom usually gets scorched, so the corn grits layer is my solution. I don't know if it's really necessary when the dutch oven isn't preheated, but I wasn't willing to risk it. 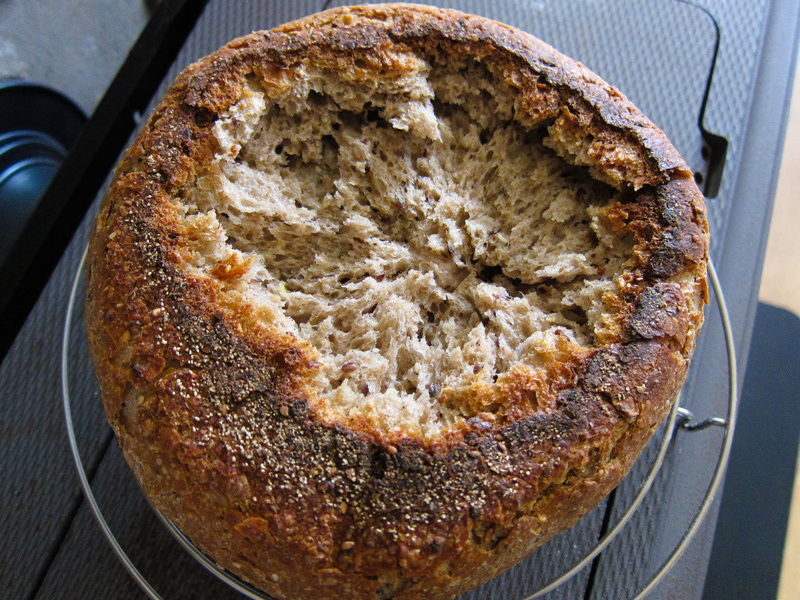 BTW, this post details using corn grits to buffer the bottom and has photos of the bottoms of bread baked in a dutch oven, both with and without the buffer layer. A very thin layer of Crisco in the Dutch oven is all I have used, and there was no sticking and medium browning. Laziness is the reason for not using anything else. Used 450 degrees F. throughout. If cornmeal were involved, I would reconsider using buffers. The first time I made cornbread in a cast iron skillet, I only used a light coating of Crisco. Big mistake. Lots of sticking. Maybe the skillet was not seasoned enough, but since then I always grease the skillet well for cornbread and tilt the skillet with the hot grease to recoat before adding the batter. I don't know why the difference between the two breads with sticking, maybe the difference between a batter and a dough, but I do know what works when. See my previous post below about not preheating the Dutch oven. My cast iron Dutch ovens haven't arrived yet, but I'm going to try this with an enameled cast iron one. I don't have grits, but I imagine polenta will work the same. A question: is a 4 qt. DO too large to do a regular size loaf...meaning the raw dough for a one loaf formula? Mine is 4 quarts. I seasoned it a few times before using it for bread, then added a very thin layer of Crisco before adding the dough. No sticking. I used the Jim Lahey NYT recipe that calls for 3 cups of flour, but letting the dough rise in the cold DO. In the NYT video, Lahey is using 5- to 6-quart Dutch ovens, and the dough is supposed to spread some once it is plopped in with his method. Can't remember exactly, but my loaves were about 3 inches high. I'm not good with bread dough, especially when handling wet doughs, so don't expect expert advice from me. I actually gave up both times after I "poured" the dough onto the counter. Icky! Neither time was the dough handled well for the stretch-and-fold part, but it was awfully good bread. Good texture, holes, color, taste, etc. A better job with stretching and folding should make a difference. Have fun with your new Dutch oven! I'm working on the theory that you'll get maximum oven spring and a nice round shape to the loaf if you match the amount of dough to the pot size. You need to measure the inside height of your pot and your lid so you know how much you have to work with. During the final proof in the cast iron DO, the amount of dough you use should be enough so that, when ready to bake, the top of the dough is just below the top of the uncovered DO. Since you're (hopefully) using a recipe you're familiar with, you should already have some idea of how much oven spring you typically get (if you bake it as a boule). Allow for at least 1 & 1/2 to (max) 3 inches room at the top for oven spring after the dough is proofed and ready to bake. I would guess that the 4 qt Lodge DO would be a good size for at least 1 & 1/2 lb of raw dough (maybe a bit more), though I don't own a 4-quart DO, so can't test it for you. They are approaching sphere-like proportions. Really lovely! Good job, great technique! I've tried the no-knead method twice with letting the dough rise in a cast iron Dutch oven before placing it in the hot oven. Beautiful bread resulted. The bottom crust had good color both times. Crisco was applied as thinly as possible with a paper towel to the interior of the Dutch oven. Warming the Crisco or the Dutch oven slightly before adding would help keep the layer thin, but cool before adding dough. You did great with this experiment. I'm sure it'll help a lot of people dealing with baking in DO, me included. I've been wanting to try baking in DO but was very reluctant with the dough handling in super-hot cast iron pan. Now, you have cleared this up, there'll be no more excuses for me to try this method. I was also worried about the prospect of handling a superhot DO. Once my starter is back in the game (I'm finding I need to adjust my schedule because of much cooler weather), this will be the first thing I try! one other advantage is that your Dutch oven and your dough is a snug fit, so it provides structure for a high hydration loaf, no risk of excessive flouring, and one less thing to wash!!! Thanks a million for your informative post. Your boules are lovely - I can't wait to try this method myself. The next time you use this method, put an oven thermometer in the oven to monitor your temperature after loading the oven to monitor temperature drop. I suspect that what you describe as "The oven temperature was lowered to 475F, so it baked at somewhere between 500F to 475F ..." is inaccurate. Simply opening the oven and closing it again will usually drop the temperature by 25 or more degrees and the amount of initial heat absorbed by the DO and the 75+/- degree dough probably dropped your initial temperature more than you realize. Neverthelsss, the results of your effort are remarkable and if the crumb compliments the crust you certainly have a winner. Interesting idea to use the cast iron skillet as a lid and thus providing more room in the DO for oven spring. I really liked the result of your use of a non preheated cast iron dutch oven. The breads looked amazing. In my bake with the photos, my dough was fully proofed before being slashed and put into the preheated oven to bake. A couple of days later I made the same dough again and baked it in the same DO under the same conditions. This time the risen dough was somewhat under-proofed (the only obvious difference) and I got slightly more oven spring (so much so that the top of the dough just barely hit the lid top). You can tell I'm still experimenting (and still learning) as I explore this method of baking. I wouldn't call it intentional, but I did observe a difference between under-proofing and fully proofing, with the slightly under-proofed dough getting a little better oven spring. 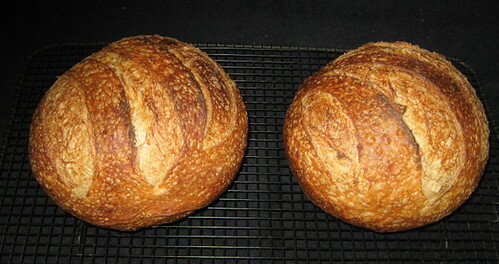 I baked two boules today from the same batch of dough. 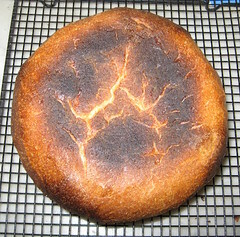 One baked in a DO without pre-heating. The other baked in the same DO pre-heated. I didn't do the grits/polenta sprinkle business. The bottom crusts of both loaves were dark, but not unpleasantly so. To avoid burned bottoms, I always use an insulated baking sheet underneath the pot. Thanks Subfuscpersona and David for the responses, This all helps. Apparently your doughs are tolerant to a wide range of proof times. I find that some days when all goes well, this happens for me too. Sometimes when I have the most doubts that this or that was handled properly, I have astonishingly good results. I sprinkled semolina in the DO before putting the dough in. However: this bread is now welded to the bottom of my DO. Apart from attacking it with hammer and chisel, any suggestions? Update: this is what the bottom looked like after I wrestled it out of the pan (perhaps I should put that in the Ugly Loaf thread :)). But I'm happy to report that it wasn't scorched (well, hardly), the taste is excellent, and the DO wiped clean quite easily after soaking in water. I'm going to do this again tomorrow - and I'll grease the DO first! 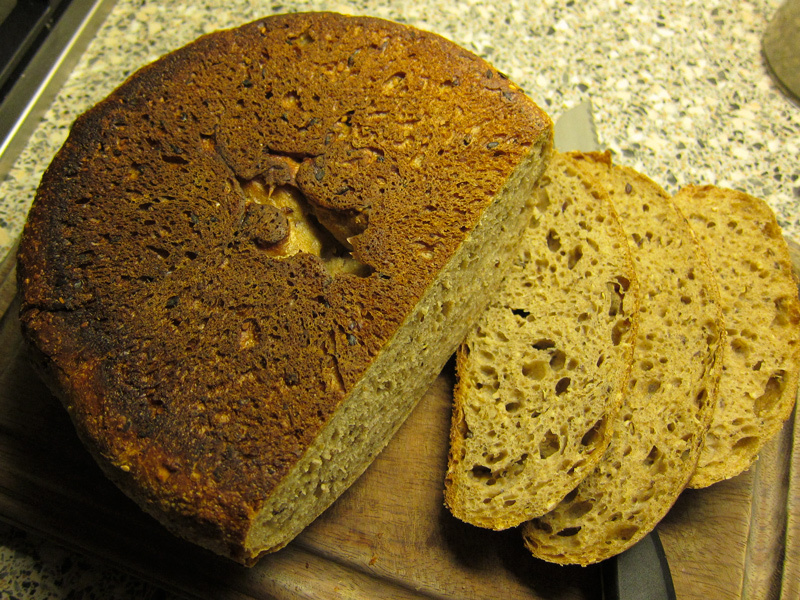 (By the way: it's a sourdough with spelt and oats, formula/method here). Tear off the top to enjoy and soak what is left. 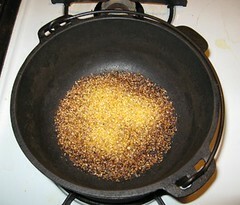 If that is cast iron, some suggest boiling the water in the pot to dislodge stuck/burned-on food. I have tried the rising-in-the-pot method twice in a cast-iron DO, and both times I greased the interior with shortening. No problems. If you don't grease the interior of a regular bread loaf pan, the bread will stick. I have always read that shortening is better than oil for bread loaf pans and for cast iron. Edit: Just saw your update. You found the solution yourself. Congrats. It's so great to be on a forum where people actually understand what you're going through :). Now I'm off to google "shortening" - I know the word, and I know it's greasy, but I've never been sure what it actually is. I use Crisco, a brand in the U.S. for solid vegetable shortening. White in color. Lard is similar in color and use, but it is an animal fat and many in the U.S. shy away from it for health reasons. Compared to shortening, lard supposedly makes better pastries and quick breads. Also, some prefer lard for seasoning their cast iron cookware. I use so little shortening in a year that I personally would have no problem with using lard instead. Thank you again. To be honest, I shy away from solid vegetable fats, because they tend to contain transfats (I'd rather have good old animal fats, as long as the animal was raised organically). I've googled a bit, and several dutch (cake/pastry) baking forums mention Crisco, and the fact that there are a few supermarkets here that have it (though not in my vicinity). Apparently the easiest way to get hold of it here is to order it online. From sexshops! Anyway, I want to bake this bread again tomorrow, so for now I'll just grease the DO with olive oil (which I buy in 5-litre cans, so there's always enough of it around). I wish I could buy butter in 5-litre cans :). As I said in my original post, I grease the sides and the bottom of the pot before the dough is put in to rise. I use a solid fat (usually lard or Crisco). Oil does not always work as well. I don't use butter either, because it has a lower burn point than lard (or Crisco). I understand your health concerns, but you're not eating it, you're just using it to grease the pot. I scatter a thin layer of coarse corn grits on the bottom of the pot. On top of that, I put a circle of parchment paper cut to the size of the pot's bottom (because I don't want corn grits baked into the bottom of my bread). The shaped dough is then placed in the pot to rise. This provides a buffer for the bottom heat and prevents scorching the bottom of the loaf. Wheat bran - or anything coarse - should work. Your bread does look lovely. I'm glad you're trying the method again and trust that the baking will go better the second time. If you chose to use olive oil (rather than a solid fat), do post back and tell us if it worked for you. Solid vegetable fat or lard would be preferable to oil for a DO or bread loaf pans, and they both can handle higher temperatures than olive oil. If the olive oil works, that will be good news for those who don't like to use solid fats. I also look forward to jaydot's results. My loaves were both in a 450-degree electric oven on the second rack from the bottom. No bottom burning. The rack held the DO more in the center of the oven. I considered starting at a higher temperature, but I knew the chances were great that I would forget to lower the temperature. subfuscpersona, I really appreciate all of the work you have done for this thread. I always use light olive oil mixed with liquid lecithin to grease almost anything and it works wonderfully. I wouldn't use Crisco, but would not be averse to using lard. However, I have never had the need, since the olive oil/lecithin works so well. I expect you are right about solid fats being better, but I'm not giving up on my olive oil until I'm absolutely sure :). For starters, I oiled the pan again after I washed it, and I'll do it again before the next bake. My DO is enamelled cast iron, and according to the manufacturer's website, it should develop a non-stick surface with regular use. I haven't had it for that long. My DO is enamelled cast iron, and according to the manufacturer's website, it should develop a non-stick surface with regular use. This makes no sense. If you are using non-enamelled cast iron, the use of fat in cooking (or just for seasoning) contributes to a non-stick surface. This is irrelevant for enamelled cast iron. Here's today's bread. I olive-oiled the (slightly pre-warmed) DO, put the dough in it for final rise, and baked it. I'm very happy with this bread. It did stick to the DO again, but not half as badly as yesterday. After the DO cooled down, I could pry it out with my fingers without damaging the bottom. Thanks from me too for starting this thread - I do love this way of baking. The oven spring is truly amazing! (Edit to add: the hole in the bottom is due to bad shaping, not damage). I have just baked another bread in a cold DO. This time I did not do the final rise in the DO. The DO was well oiled with olive oil (and nothing else, no grits, no parchment). The boule slid out of the pan with no trouble at all! (And I'm thoroughly delighted with the way it looks, it's probably my best looking bread to date!). Now my next challenge is to get a loaf to sing :). Glad to hear the oil is working for you. Nice bread from the one before. You must be happy with this method. I haven't used my 5 quart dutch oven for bread. What size loaf would a 5 quart take. I usually bake my loaves about 1/2 to 2 lbs of dough at a time. I should have said I bake my loaves using 1 1/2 lbs to 2 lbs of dough. Sorry! A 5-quart Dutch oven should be fine. In the NYT Jim Lahey video, a 5- or 6-quart Dutch oven is suggested. Just be sure the handles and lid knob are oven-proof. I use my 4-quart, cast-iron Dutch oven. Give yours a try. Only 3 cups of flour are used in the Lahey recipe, so it is not a large loaf. Anyone know the pound size? do NOT preheat the cast iron dutch oven and lid?? I have always been intrigued about baking sourdough in my Staub, but I am confused about the instruction to NOT preheat the cast iron dutch oven. The instructions that came with my Staub cautioned to NEVER place cold in a heated oven. I love my Staub and use it weekly; I cook on the stovetop and then put the whole pot in my pre-heated oven...so it's always heated before placing in a hot stove. If somebody can please explain or reassure I'd appreciate it! I suspect that, with enameled cast iron, one can - over time - stress the enamel coating by putting a room temperature pot in a very hot oven. The enamel coating may develop fine cracks or be more prone to chipping. It's your pot (and Staub is an excellent brand) so it should be less subject to this than a cheaper brand of enameled cast iron. However, given it's price, if you value the appearance, you might want to use a non-enamled cast iron dutch oven for this method of bread baking. Cast aluminum pots also work well. The other point in the original post is to use a smaller capacity dutch oven and have the dough rise directly in the pot prior to baking. The Lodge 3-quart combo cooker seems a flexible size for a number of bakers who have used this method. 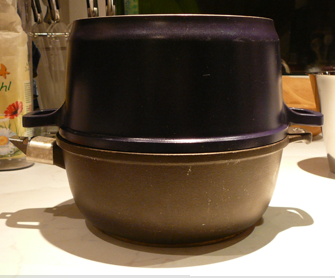 TFL member MiniOven uses cast aluminum pots or woks (handles removed) - she posted this photo of her dutch oven (using a pot as a cover). 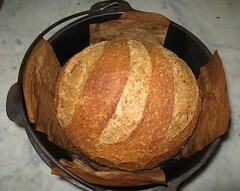 See her original post at http://www.thefreshloaf.com/node/26049/cold-dutch-oven-proof-bread-then-bake#comment-193886 for the woks she uses for a larger bread. (thanks MiniO). Your loaves look beautiful and that's what triggered me to think about this method again! Have you tried this method? If yes, please do post back to this thread to share your experience. There is a difference between a cold dutch oven and a room temperature dutch oven. Frankly, whether I am using non-enamled OR enameled cast iron, I would *never* put a cold / refrigerated cast iron dutch oven directly into a hot oven. The virtue (and limitation) of cast iron cookware (enameled OR non-enameled) is that it is slow to heat but retains heat well. Subjecting cold cast iron directly to even moderate (350F) heat, is, IMHO, a recipe for disaster. I still think that placing an enameled room temperature cast iron dutch oven in a very hot oven (450F or higher) can stress the enamel coating if this is done repeatedly. On the other hand, non-enameled cast iron cookware will not be damaged as long as the temperature changes are not too extreme and/or sudden. I use the method from Tartine. 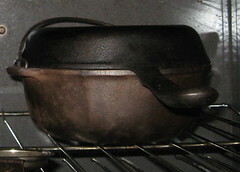 The "Double Dutch Oven" available, seasoned from Lodge, has a shallow skillet for the lid, a rim that holds the seal of the two in place and has a handle on the front of the pans for ease in lifting. I have two, so do multiple loaves at a time and never have to oil or grease the bottom. Because the shallow skillet is used to turn the loaves onto from my bannetons, there is little chance nor difficulty in turning the dough out onto the hot skillet. It gets covered then with the deep dutch oven side, and into the 500 degree oven. Then it is turned down to 450 for the bake, 20 minutes covered, then remove the dutch oven which has become the top and finish the bake for another 20-25 minutes. We bake dozens of loaves a week without any problems. If you follow the guidance of Chad Robertson, you will make beautiful bread. 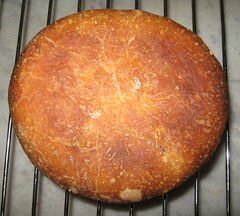 The final makeup is key to the nice round loaves, but once you have this technique down, you will utilize it for many variations. I have, however, switched to baking bread directly on my pizza stone. The crust turns is fabulously crispy compared to using a regular pan. I hoped this would be the answer to how to do no-knead rectangular convenient toast / sandwich shaped loaves. It didn't work. Used a recipe that previously yielded a wonderful loaf, but instead of pre-heating a heavy pot, I put my dough in a cold (thin, light colored) loaf pan covered tightly in aluminum foil, then put that in an oven preheated to 500°F, reduced to 425°F, cooked 30 minutes, removed aluminum foil, cooked 15 more minutes, then another 5 minutes because the crust wasn't looking very good, but it didn't help. Top crust ended up soft. Got decent oven spring. Top didn't tear open nearly as much as with the pre-heated pot. Maybe I need higher heat for longer, at the beginning? The pan might be a little large for the amount of dough I cooked, so more heat wasted heating air? 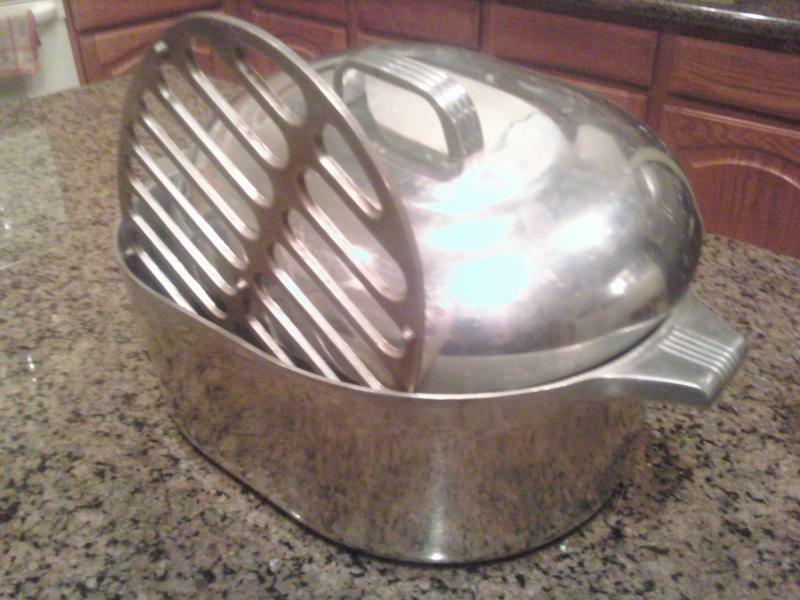 Wish somebody made cast iron loaf pans with lids. I've been thinking about emailing Lodge to ask them about it. But it would be better to work this out without buying new equipment. Has anybody gotten this to work with a rectangular loaf pan? 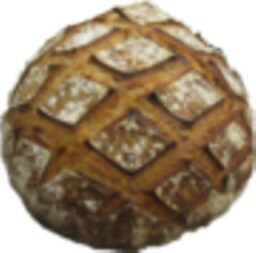 I'm new to the site, but have read many, many posts in my quest for the perfect loaves. This is a great resource. After a long wait, our cast iron (Lodge) bread loaf pans arrived. I've been wet loaf no-knead in Pyrex with a downright giddy degree of success. My Pyrex experiences are all "cold" pan method, e.g. no preheat, were challenged by bread sticking in the pan, until I switched to butter - good old butter. In Pyrex 3 qt casserole, I use 1/4 teaspoon and nothing has stuck - ever. Butter is wildly efficient. So, my cast iron pans arrived and I, as instructed here and elsewhere, used oil. What a mess. I got the loaf out, but it's severely damaged. The Lodge loaf pans look very, very nice. Excellent QC in manufacture. I'll post again on the results. I've been anxious to try my spelt loaf in cast iron - just to see if I can tell the difference. Many thanks to all for insights. I have been baking my Tartine loaves in regular rectangular loaf pans while waiting for my Christmas gift Lodge combi cooker to arrive. I let the dough rise in the loaf pan, slash and put in 500* oven with another loaf pan inverted over it for the first 25 minutes. Just need to buy extra pans, or find regular loaf pans that fit over your CI pans. Also leaves a lot of room for oven spring! that is such a great idea with the loaf pans! thanks for sharing. its good too, as it doesn't take up extra space in the oven, so you're able to bake more than one or two loaves at a time. so does anyone bake from cool oven and get good results? i will try the butter, thanks. as i've had problems with loaves sticking too. i wonder, does anyone ever bake from a cool oven, with a large oven and still get good results? the reason i ask, is i used to always get great oven spring if i underproofed and baked from cool oven, with my old smaller oven. now, even wen i preheat, i still have the problem of loaves sticking to the bottom of the pot, may have to start using baking paper. As I am a newbie, I can ony speak from limited experience. 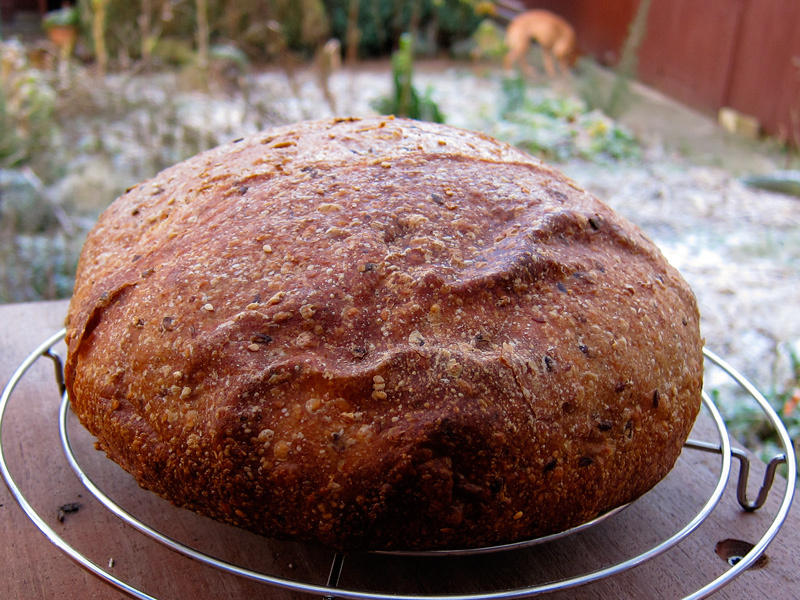 I have had issues with spring due to low gluten in spelt flour - I tend to use 50/50 white bread flour and spelt. Rather than jack up the yeast, I provide a warmer environment for final rise prior to baking. I'll bring the oven to about 100F and put the loaf in for a final rise, take it out after 1.5 hour, and start the oven. During the oven warm up, I'll set the loaf over the oven vent using the cooling rack as a riser so I don't block the vent. I get a great rise. My spring project - an outdoor wood fired oven. I've been very comfortable with mechanical, electrical and woodworkingtype projects - I've never done an masonry. But, I'm pretty psyched about this project. I have ash, cherry wood, oaks and birch in my woods. I don't intend to smoke, but as I have read, the character of woods will leech into the foods baked in a brick oven. I was taken back to my mother in laws old Shabot aluminum chicken roaster my wife inherited. It is a Wagner Ware Magnatite 13"x 10" x7" covered roaster . I was going to make my next baking project a cold oven cast iron enamel challah experiment but heard a hot oven start could damage it. I cold start my challah in a Pyrex loaf pan all the time . This roaster comes with a raised plate on the bottom to get air circulating under the loaf as well. It was made in the 30's since it was my wife's grandmother's originally. They still sell these things new for $110 and they have smaller round ones that may be better for bread. I have also seen both at Goodwill for a buck each on Thursdays. that looks cool for baking bread! and don't have to worry bout a burnt bottom. i had some left over diced boiled potato, added rosemary, salt and pepper, and olive oil, and parmesan, and folded through one batvh of original jim lahey bread. made one original recipe also. my oven can fit two pots at the same time. its jus a matter of finding the right pot and approach. i am determined to make successful bread in a pot like i used to in my old oven! does anyone bake from cool oven and get good results? I'm the OP. This thread focused on baking artisan bread in cast iron without having to preheat the cast iron pot or lid (although the oven is preheated). I've found I must preheat the oven to produce good artisan bread. However, I do have good success baking regular sandwich loaves by placing the risen dough in a cold oven. You need your oven preheated to a high temperature in order to get the good crust typical of artisan loaves. In contrast, sandwich loaves are typically baked at a lower heat so, for them, I find a cold oven works well. As for oven size, I don't know why your new (larger) electric oven is giving you problems. You should check your oven for temperature accuracy and experiment with oven rack placement. FYI, my oven is an old, inexpensive gas oven with heat source on the bottom. The oven rack measures 25x17". thank you so much SF for getting back to me :) you have answered my Q. for todays no knead pot breads, i shall pre heat the oven. i'll have a look at your link, those loaves of yours rose lovely! will also have to buy a thermometer for temp, any advice there? i have no idea, and don't want to get anything too expensive. okay, well, i preheated the oven, greased with butter two pots, one oval pyrex dish, and one cooking pot, wanted to take pics, but today was a bit hectic. i'll upload pics later. orginal lahey bread did not stick to the pyrex greased with butter. the potato bread smelled fantastic but stuck. i managed to pull it out without leaving too much stuck behind. tastes really good, but didn't get much rise with both. still not satisfied with results. will keep trying. Well, I've had a couple trials with my new Lodge bread pans - rectangular. I switched to using butter instead of oil. The release from the pan was perfect - popped right out. We've finally experienced the buzz of cast iron - the crust is so much more delicate. The last batch of dough went 72 hours in the fridge - just plain awesome. I've always been fond of the spelt flavor, but the longer term proof actually lightened (not lessened) the spelt nuttiness. A couple more "baseline" loaves and I'll start messing around with temperatures and start steaming again. Oh - the quality of the Lodge rectangular loaf pans is excellent. Great value. This is the closest I can get to with a DO and lid combination in cast.